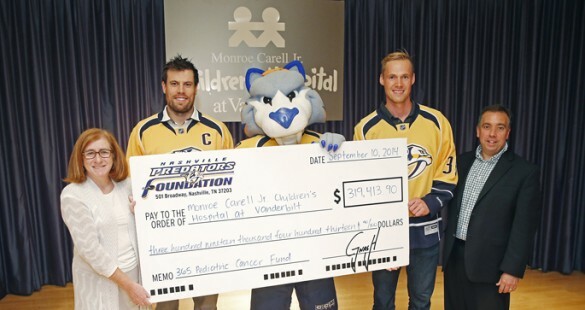 The Nashville Predators Foundation recently presented a $318,242 check to Monroe Carell Jr. Children’s Hospital at Vanderbilt for the 365 Pediatric Cancer Fund. The latest donation is the largest the Predators hockey team has ever given to Children’s Hospital for the 365 Fund, previously known as the Nashville Predators Pediatric Cancer Research Fund. Over the past five years, it has raised more than $900,000 for the hospital and its programs. In the spring, the Predators renamed the annual fundraiser to the 365 Fund Pediatric Cancer Fund presented by Dollar General, with team captain Shea Weber and goaltender Pekka Rinne spearheading the generosity. “Shea and Pekka are leaders on the ice, but also in the community,” said Nashville Predators President/COO Sean Henry. The funds raised help researchers at Children’s Hospital study the molecular basis of childhood cancer and develop novel treatment approaches to improve outcomes for children. “We are so grateful and offer our heartfelt thanks to the Predators and the Predators Foundation. We would not be able to do what we do in this hospital every day without the Predators support,” said Debra Friedman, M.D., E. Bronson Ingram Professor of Pediatric Oncology, associate professor of Pediatrics and director of the Division of Hematology/Oncology. “It’s only through the generosity of groups like the Predators Foundation that we are able to do research. Our researchers are taking all that great information and bringing it to all the kids in our oncology unit. We are trying to understand what causes childhood cancer so we never have to tell a parent again that their child has cancer,” Friedman said. Money for the 365 Fund is raised during Hockey Fights Cancer games, silent and blind auctions, mystery pucks and fan donations. Weber and Rinne also purchased two suites at Bridgestone Arena that were renovated to become one large suite, which is used to host patients and families from Children’s Hospital for home games. In addition, on a few designated nights the suite will be auctioned off and 100 percent of the money raised will go to the fund. The next Hockey Fights Cancer Night is scheduled for Saturday, Nov. 15, for the game against the Winnipeg Jets.